The Earth formed from the accretion disc material that was orbiting Sun at the distance of about 0.8-1.3 AU. 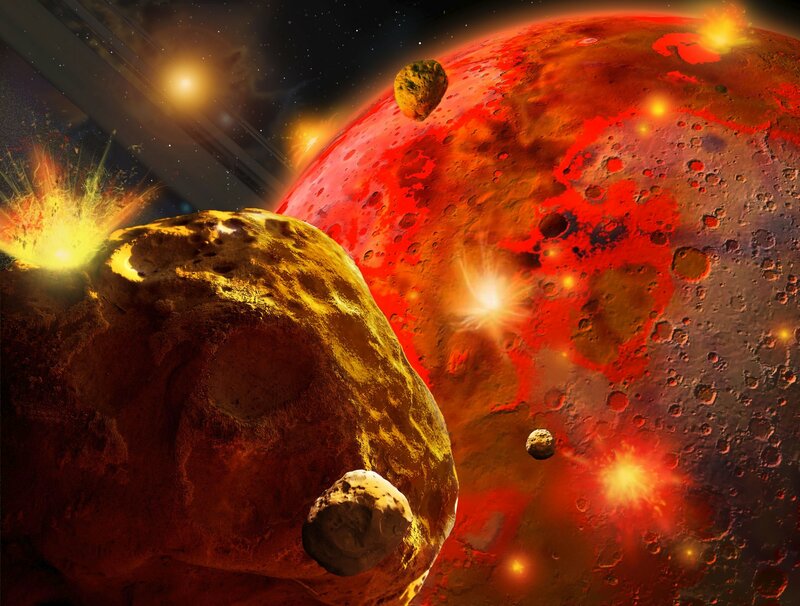 The birth of the Earth was quite a violent process. Rocks of different sizes crashed into each other, forming larger rocks, which continue to have rocks crashing into them. Due to the impacts, and the gravity of the accreting body and the temperature of the surrounding disc, the temperature of the protoplanetary body was very high, at least 2000 Celcius degrees on the surface, and it was in form of molten magma at least down to the depth of few hundred kilometers. In the course of time, the numbers of impacts became smaller, but the sizes of the impacting objects had become much larger. At 20 million years after the birth of the Sun the protoplanet had almost reached its final size, but there was still one more major impact to come. This was the one where the Moon was formewd from the rocky ejecta of the impact. This huge impact blew away the whole initial atmosphere. The permanent volatile substances, such as water and atmospheric nitrogen have come to the Earth much later, with asteroids and comets.